I've never really shared much about my actual design process, but today I want to share the one design tip that has single-handedly helped define my invitation style. Tracking. As in, the uniform spacing between all letters (not to be confused with kerning, which is where you go in and tweak spacing between individual letters, usually after they've had tracking applied. Designing with typography goes so much farther than simply writing out text on a page, and I sincerely think the difference between a novice looking invitation and a well designed invitation comes down to the use of fonts and spacing. To show the impact of tracking, here are two of my designs. The top has tracking set to 0, and the bottom has various amounts of tracking. Here's the Cruise design, which relies completely on typography to make the design strong and visually pleasing. See the difference? The top one is smooshed, cramped, and feel clunky. 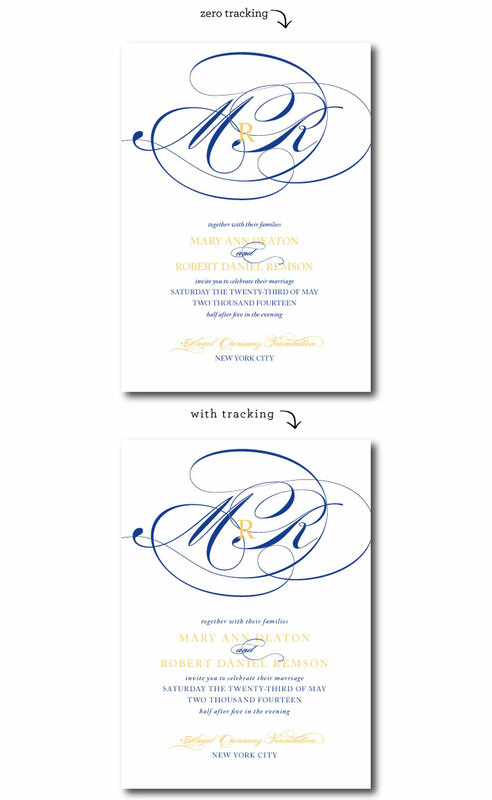 The bottom one has lots of breathing room and uses the tracking to highlight and enhance specific parts of the invitation. 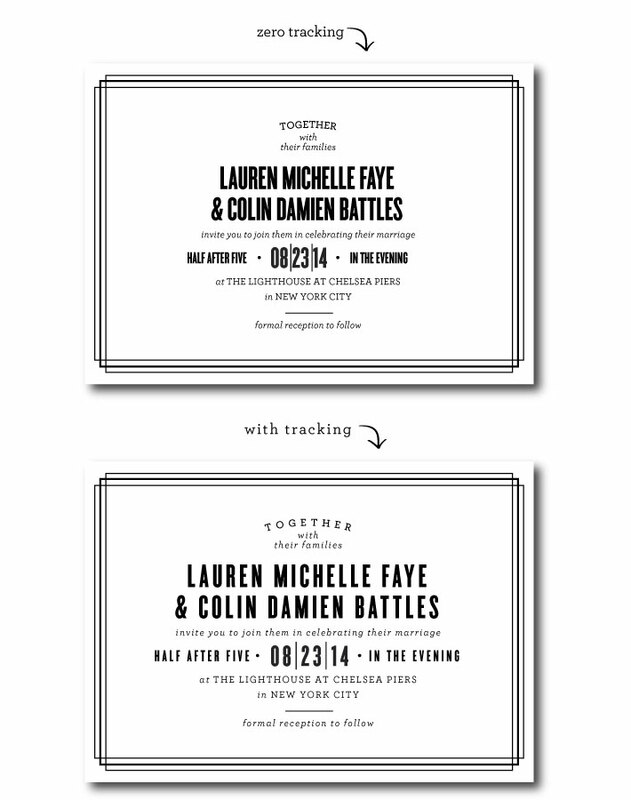 Now let's look at a more traditionally laid out design, the Rosé invitation. It's subtle, but you can see how the bottom invitation is easier to read and feels more pleasing to the eye. Most people will think the bottom looks more expensive, but not really know why. It's because it's well designed and the typography is thoughtfully used. Now, a HUGE pet peeve of mine is when there is tracking in a script font. Friends, isn't the whole purpose of a script to beautifully connect each letter? So if the letters are supposed to be connected, WHY would you add spacing? It baffles me, and honestly border-line offends me when I see this mistake made. I get annoyed that designers charge their clients money and then provide something that's so awful and cheap looking. Do NOT add tracking to script, people! Ick, I cringe just looking at that bottom one! 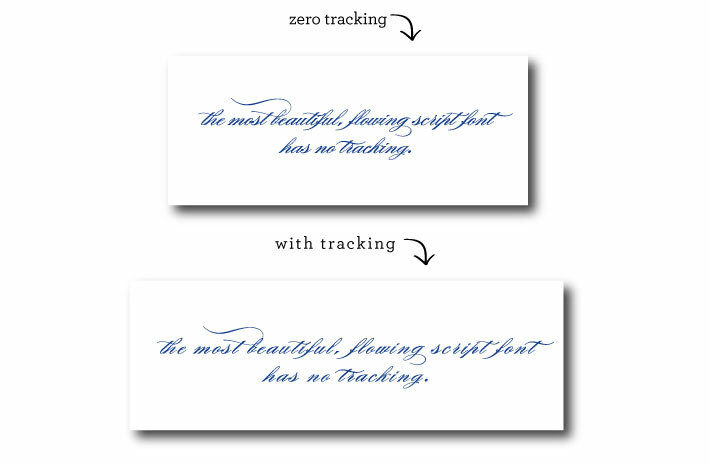 I hope this post helps you look at typography and tracking a little more closely now. As a designer, if this isn't something you usually do, I urge you to start playing with your tracking (in the typography control panel in Ai).